Tensions were high late Monday in Moscow's Domodedovo Airport, where thousands of passengers spent hours with no food or drink except what they had with them and no information on when their flights might depart. 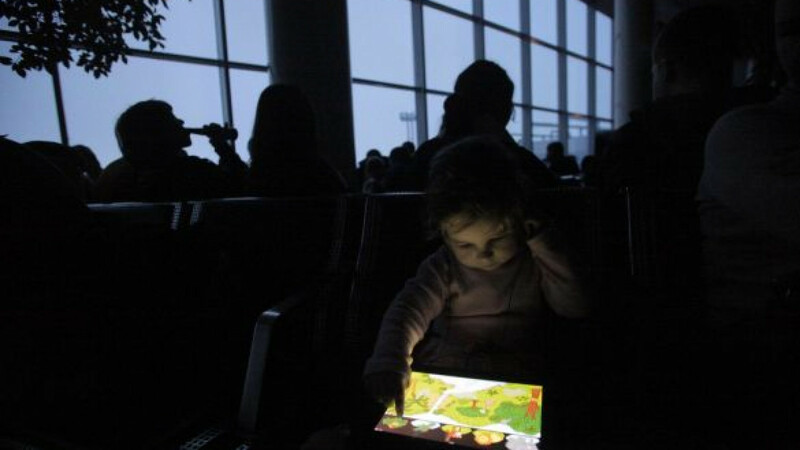 The airport — lit only by candles — suffered a 14-hour blackout Sunday, after an ice storm disrupted power lines in the area. Some 8,000 people spent a sleepless night on the premises as more than 150 flights were delayed at the capital's largest airport, Domodedovo spokeswoman Yelena Galanova told Interfax on Monday. Departure halls and local cafes at the airport were still unlit as of late Monday, and passengers, many on the verge of hysteria, thronged check-in desks for information on their flights, a passenger who asked not to be identified told The Moscow Times. Domodedovo was crippled by the blackout since it only had five diesel generators, barely enough to keep navigation equipment operational. More generators were delivered by Monday, but the power lines remained down, Interfax reported. Domodedovo operator's, East Line Group, called the situation “critical” and asked authorities to restore power lines in a public statement provided to The Moscow Times. The passengers said they had to spend time in the unlit halls without any help or information. “It was completely dark, everyone was running around and nobody knew anything. I was shocked by the complete indifference of airport officials toward passengers,” blogger Anna Goryainova wrote at 1 a.m. Monday. She posted several photos taken inside the terminal as she waited for her flight to Egypt. The shots showed passengers dining on the floor in candlelight and one even playing a flute to kill time. Getting to and from the airport also became a problem, as the highways were jammed and commuter trains stalled for hours. Bloggers reported that unlicensed taxi drivers were quick to capitalize on the passengers' plight, charging up to 10,000 rubles ($300) — several times the regular fare — for a ride back to the city. As of 3 p.m. Monday, 110 flights arrived and 74 departed from Domodedovo, RIA-Novosti reported, citing the airport's press service, which also said all passengers were provided food and drinks. The Federal Aeronautical Service will order all airports nationwide to have autonomous power generators to avoid such situations in the future, the watchdog's head, Alexander Neradko, told RIA-Novosti. Vitaly Bushuyev, head of the Energy Strategy Institute think tank, said blame lay with the airport's operators. “When light is out in an airport or a maternity clinic, this is not a problem of some air traffic controller, but of the managers who have built the power supply system so that any small issue can cause a problem,” he said on the institute's web site. Gennady Onishchenko, of the Federal Consumer Protection Service, called on passengers to sue. “They have to remind service providers that sooner or later, situations where blame can be shifted to nature and climate will come to an end,” he said, Interfax reported. But a representative of a Moscow travel agency said cases against Domodedovo would probably fall flat. “They will likely cite force majeure,” said the representative, who asked not to be identified because she was not authorized to talk to the press. At the same time, passengers may sue carriers, who are required by law to provide them with food, drinks, lodging and information in case of delays, said Maria Sviridova, a lawyer with the independent Consumer Protection Society. Calls to offices of major carriers Aeroflot, Transaero and S7 went unanswered late Monday. Another Moscow hub, Sheremetyevo, had no blackouts but faced heavy delays for some 7,000 passengers, with neither the airport nor carriers providing them with any information on when their flights may depart, RIA-Novosti reported. Sheremetyevo said in a statement that it has handed out free snacks and some 3,000 bottles of water and provided lodging for more than 2,000 people.